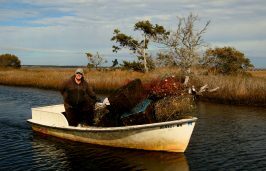 Editor’s note: this story has been updated to include the final count of crab pots collected by the North Carolina Coastal Federation this year. A small skiff cruises over the calm waters of Bogue Sound, slowing down as it approaches the Emerald Isle boat dock in Carteret County. Onboard are fisherman Marty Frost, his wife, Sue, and their 13-year-old grandson, Hunter. Surrounding them are about 20 broken and derelict crab pots Frost removed from the waters and hoisted onto his vessel. 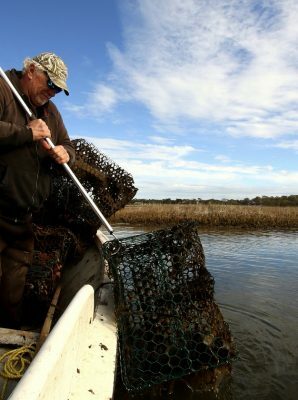 Frost, 59, of Salter Path, is one of 72 fishermen working with the North Carolina Coastal Federation’s annual Lost Fishing Gear Recovery Project, an effort to remove marine debris from waters all along the state’s coast. This year, the program grew in size thanks to a $100,000 appropriation from the state General Assembly. 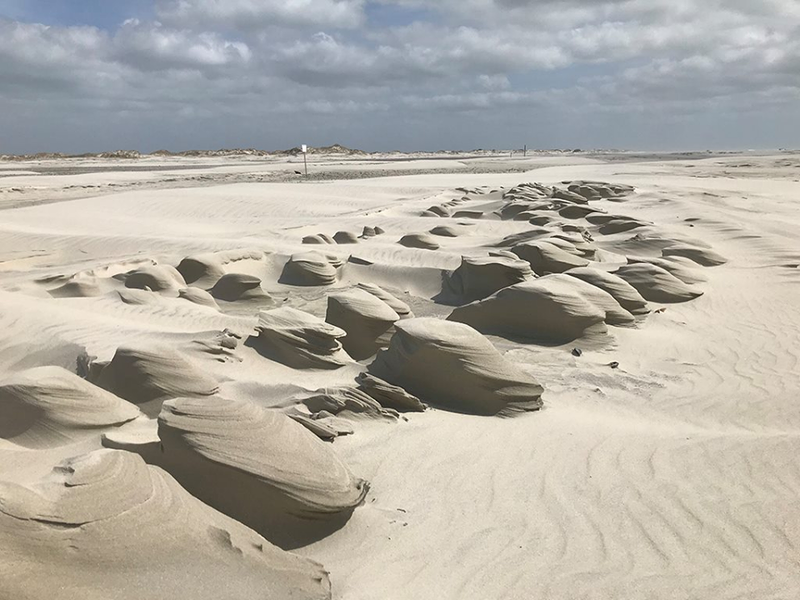 “We were really able to expand substantially this year,” said Ladd Bayliss, a coastal advocate at the federation’s northeast office in Wanchese and the manager of the federation’s project. 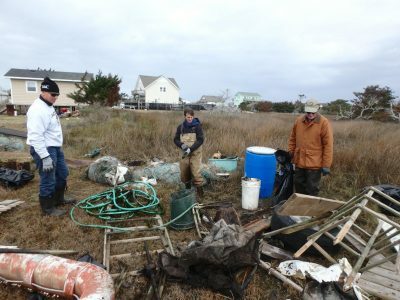 Through funding provided by the appropriation and the National Oceanic and Atmospheric Administration’s Marine Debris Program to remove items that pollute and obstruct waterways, the federation was able to hire about 30 more fishermen and extend the project all along the state’s coast. The federation has also teamed up with the North Carolina Sea Grant for aspects of the project. 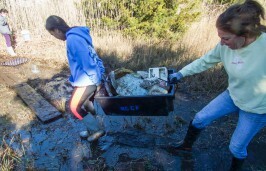 To kick off the annual project, the federation held coastline cleanup projects in three locations on Jan. 14: Hatteras Island in the Outer Banks, Morris Landing Clean Water Preserve in Holly Ridge along Stump Sound and Hoop Pole Creek Nature Trail in Atlantic Beach. 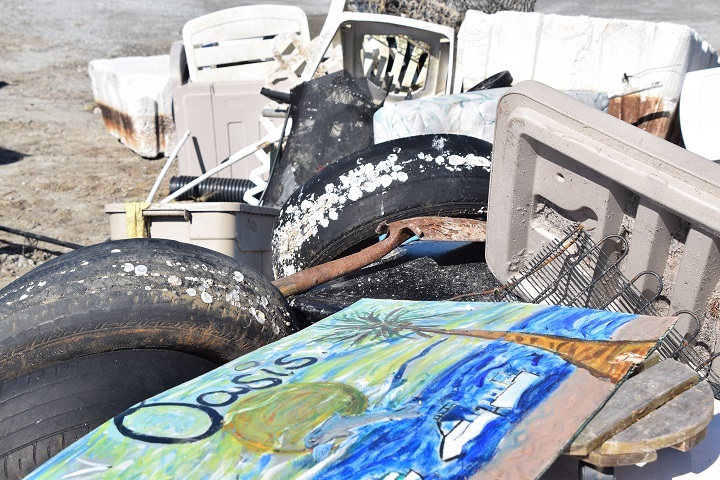 Between the three locations, 138 volunteers worked to pick up more than 4,500 pounds of onshore marine debris. Commercial fishermen, like Frost, were hired by the federation to use their expertise to clean up the sounds during the fishing off-season. This year, they removed debris, mostly crab pots, for a little more than a week starting Jan. 18, during the state’s “no-potting” period. Bayliss said that the knowledge commercial fishermen have of the water makes them suited to remove crab pots. “What they bring to the table is a real depth and care about the sound,” she said. Tapping into their knowledge and experience, she said, is important, as removing the crab pots is not an easy task. The pots on Frost’s boat are in various states of disrepair. A few are slightly bent, but otherwise look brand new. Some are shredded beyond recognition, likely by boat propellers, but most are covered in years of oysters and marine growth. “You take like this one here – there’s no telling how long it’s been,” Frost said, pointing to a pot barely visible amidst the green algae covering its wires. In the shallow waters of the Bogue Sound, which Frost said only reaches 8 feet at its lowest points, he can spot the crab pots at the bottom, in marsh grass or occasionally attached to a buoy. He then usually uses a rod and hook to fish out the pot. Frost said he picked up 10 pots during his last trip on the water, rounding his total count out to 30 in the 5- or 6-mile radius he covered over two days. Many of the crab pots had been swept away by storms. Tags that once bore the names of their owners are now long gone. Buoys that once marked the locations of the crab pots are now often nowhere in sight. Bayliss said some crab pots have been found as far as 10 miles from their original location. “More pots were lost because there were significant storms in the fall and in the spring,” Bayliss said. Crab pots are more than a nuisance in the shallow waters of the sound. They are, as Frost puts it, a hazard for both commercial and recreational fishermen. Not only do they get caught in the propellers of boats in shallow waters, but they continue to trap and kill crabs, fish and other marine life that find their way inside. Beyond that, Frost said that as a fisherman, he wants to keep the waters he depends on clean and healthy. The program extends across three North Carolina Marine Patrol Districts all along the state’s coast. District 1 covers northeastern North Carolina, extending from the Virginia state line to Manteo and Swan Quarter. 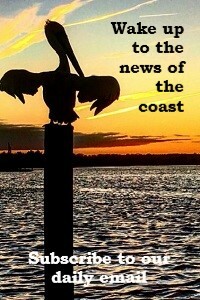 The central coastal is District 2, encompassing areas from the Pungo River to Morehead City and Emerald Isle. District 3 is to the south, starting at Cape Carteret and extending down to Wilmington and the South Carolina state line. This year, thanks to the additional funding, the project expanded for the first time beyond the District 1. Each boat is required to have at least two crew members and receives $400 for every six-hour day the team works. Bayliss said she tries to give every boat three days on the water. 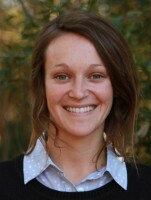 The data from the project is given to North Carolina Sea Grant. Once the crab pots are removed from the water, they are disposed of in landfills. In the past, the federation had experimented with using the crab pots to build oyster reefs, but regulations make that difficult to do. The federation reported the project has collected over 2,000 derelict crab pots through the program since 2014. This year, the fishermen picked up 4,270. Frost said that before this year, he had heard about the project but couldn’t participate because of his location. When he saw in a local newspaper the opportunity to apply, he knew he had to. Now, he said, he was glad to be a part of the project and that he hopes funding for it continues in the future. Frost said that his family fishes during the summer, but goes oystering in the winter. This project, he said, will supplement those earnings. Frost said he enjoys working on the water and that he appreciates the opportunity to keep it clean. He said he’s been on the water for 50 years, since he was a boy, and that the water is his home.